From #1 New York Times bestselling author Karen Kingsbury comes the third and final novel in an unforgettable series about four friends and the divine intervention that changes their lives forever. Against the advice of her doctor, Mary Catherine moves to Uganda to work at a new orphanage. Whatever time she has left, Mary Catherine wants to spend it helping children—especially since she is unable to have children of her own. The only problem is Marcus Dillinger, the Major League Baseball player she was never meant to fall in love with. But neither Marcus nor Mary Catherine’s other friends—Tyler Ames and Sami Dawson—know just how serious her heart condition is. Still, Marcus suspects something isn’t right. After months of silence, a divinely timed letter from Mary Catherine leads him on a desperate life-or-death mission to get her to a US hospital before time runs out. Meanwhile, as Sami and Tyler prepare to marry, the group receives shocking news that changes everyone’s plans. The team of angels walking is busier than ever in this epic battle between life and death. Brush of Wings is a poignant tale of love, sacrifice, and the power of faith. 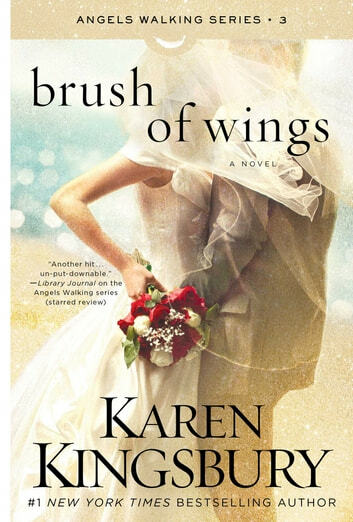 Brush of Wings by Karen Kingsbury is the third book in Angels Walking series. Orlon is sending Ember, Beck, Jag, and Aspyn (an Angel Walking team) on an important mission. They need to make sure that a little baby gets born and to keep four individuals alive and together. Mary Catherine Clark is leaving for Uganda to help out at a new orphanage. She has always wanted to do this. However, Mary Catherine has a heart condition that is now life threatening. Mary Catherine needs a new heart, but she is not letting that stop her nor is she telling anyone about it. Marcus Dillinger is a baseball player with the LA Dodgers who cares for Mary Catherine, but she keeps pushing him away. She feels that he should get a chance at love with someone who might not die. Sami Dawson is Marth Catherine’s best friend and roommate. Sami works at the Youth Center where Mary Catherine also volunteered (until she decided to go to Uganda). Sami keeps getting Mary Catherine to confide in her, but Mary Catherine is keeping mum. Sami is in love with Tyler Ames, a coach with the LA Dodgers (and a friend of Marcus). Can the angels work to keep these four people alive and the demons at bay? It is imperative that their mission be successful. Brush of Wings is basically a long (sappy) romance novel with angels, scripture, and prayer thrown in. The novel contains quite a bit of scripture and prayer (basically every page someone is praying or asking people to pray). I found the book hard to get into (I actually never did get into the book) which takes away my enjoyment of the book. Mary Catherine is the main focus of the book, and I found her to be a martyr. I did not like her and found her extremely annoying. This is the third book in the series, but I believe the novel can be enjoyed without having read the first two books in the series (I actually did not know it was part of a series until I started reading the book). I give Brush of Wings 3 out of 5 stars. Readers who love Christian romance novels will probably enjoy Brush of Wings. I received a complimentary copy of Brush of Wings from NetGalley in exchange for an honest evaluation of the novel. The Last book of THE ANGELS WALKING was beautiful. By happenstance I had picked up the 1st two books at our local library. Could not find the third so had a gift card and used it to load up my KOBO. Loved Mary Catherine and Marcus. Reinforces the scriptures regarding angels as well as actually listening to God and following His precepts. All in all a delightful read. Brush of Wings was a very touching story. The Angel's Walking Series makes you really think about how much God loves each of us. When Mary Catherine moves to Uganda to work in an orphanage, she knows she is putting her health at risk and proceeding against her doctor’s orders. She needs a heart transplant, but longs to spend what time she has left helping children. It also means she must leave behind professional baseball player, Marcus Dillinger, the love of her life. She feels she can’t tell him the truth and tie him to her, given her health issues. Mary Catherine also hasn’t told her parents or friends Sami Dawson and Tyler Ames how seriously ill she is. But Marcus isn’t willing to give up on Mary Catherine, even when she tries to step away from him. He just feels something is wrong and in the end, Marcus makes an emergency journey to Uganda to bring Mary Catherine home. Even with angels working in the background, Mary Catherine’s life hangs in the balance. Brush of Wings is a wonderful story filled with love, faith and sacrifice. This is the third in the angels walking series, but it stands alone.